Alyaa Mohammed, Zahraa Dagher, Mohammed Alqassab, Mohammed Hisham, Balqees Janahi, Khaled AlBelooshi and Mohammed AlIsmail. 2. How did it feel to win the Start-Up Weekend’s First Prize?! 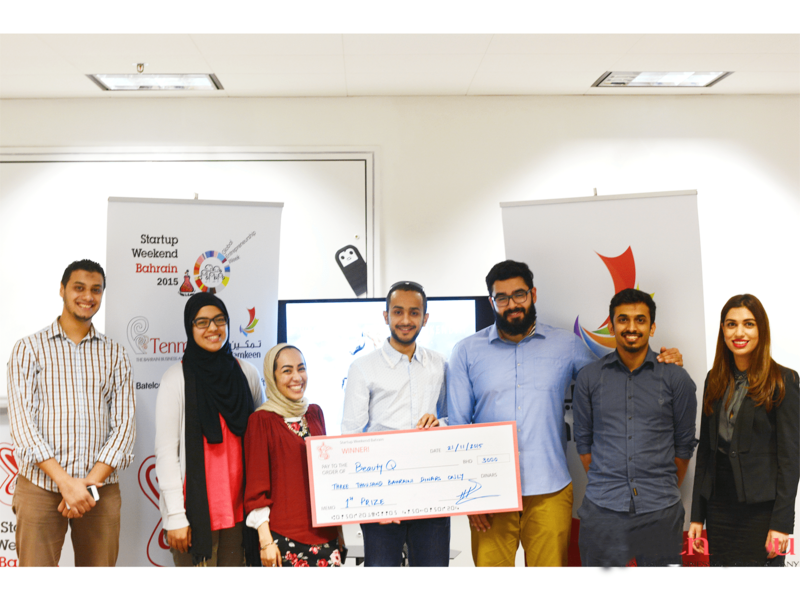 We had it as a goal since day one of the Startup Weekend to win First Prize, so it was an overwhelming feeling to actually realize that goal! 3. Tell us briefly about Start-Up Weekend and how you won it. Startup Weekend is a global non-profit organization found in over 200 cities around the world. People around the globe come together for weekend long workshops to pitch ideas, form teams, and start companies. In the first day of the weekend, I pitched the idea that Alyaa and I were conceptualizing and developing. We wanted to introduce technology to salons management and change the future of beauty business. The web-based application makes last-minute booking possible without having to make a call. Users will even get alternatives to select from according to their preferences of time, location, price, service type and such. Through the app we aim to link business owners with customers because it introduces salons and services and locates them on the customers’ map. Salon managers will have access to a versatile, feature-packed platform where they can create and manage beauty services and bookings at ease. Managers will also get customer reviews and analytics like customer demographics. Business is no longer limited to working hours because customers can make appointments any time through the app. The pitch was one of the top pitches at the weekend then we recruited members to work on the idea further and validate the market. Over the weekend, Khaled and Mohammed Hisham were able to build up and launch a fully-functioning web-based app that users can book salon appointments from. Mohammed Alqassab and Mohammed AlIsmail were the genius marketeers that were able to generate over 1000 instagram likes to our newborn instagram account in less than 12 hours. Alyaa Mohammed was the business brain who managed to pivot our business model. Balqees Janahi and I went on field to prove salons’ interest in the app. We were able to convince high-reputed salons to be on board. At the end of the weekend we had an MVP that validated our idea with 10 bookings made through the app. In the last day, I presented our work thought the weekend to a panel that evaluated the pitches based on Design, Validation and Business Model. And that’s the story of how we won First Prize! 4. Having started off as per your business model, what are the plans from here? We’re excited to go further with the idea. Right now we are revising our business model one last time to start pitching. 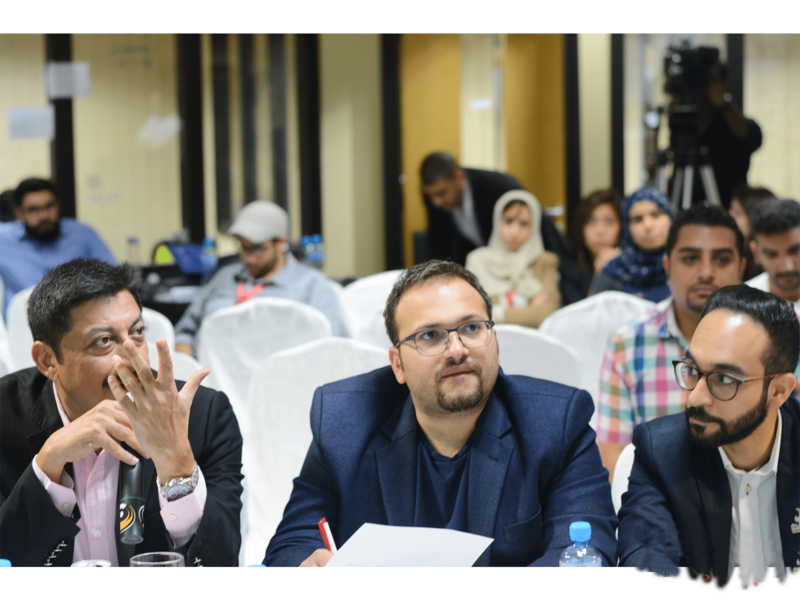 We will approach investors who see the impact our product will make and its relevance to the beauty market in Bahrain. Aside from that, we are approaching salon businesses to introduce them to how BeautyQ’s features will enhance their business and increase their clientele. 5. What are the obstacles that you are still encountering? Right now we are just kicking off with the idea, so the challenges are yet to come! We are looking for investors and salon owners who are eager to pioneer this product. 6. Can the concept of the Beauty Q application be used for other shops/services too? Yes. Since beautyQ concept is placing online bookings, the concept can be applied and is being applied already on other services as well. 7. Do you intend to diversify in the future? If yes then please elaborate. Right now we our focus is salons offering services for females. Our plan is to expand to serve males and also include spas and health services. 8. What according to you is the basic requisite for any start-up to be successful? 9. Does technology enhance the quality of life or degrade it? Technology used well will definitely enhance quality of life. You can use your time more effectively and efficiently and be more selective and in control. 10. What is your message to aspiring entrepreneurs? Stop talking about your ideas, instead make them happen!